Fifth Roman procurator of Judea, Samaria, and Idumæa, from 26 to 36 of the common era; successor of Valerius Gratus. According to Philo ("De Legatione ad Caium," ed. Mangey, ii. 590), his administration was characterized by corruption, violence, robberies, ill treatment of the people, and continuous executions without even the form of a trial. His very first act nearly caused a general insurrection. While his predecessors, respecting the religious feelings of the Jews, removed from their standards all the effigies and images when entering Jerusalem, Pilate allowed his soldiers to bring them into the city by night. As soon as this became known crowds of Jews hastened to Cæsarea, where the procurator was residing, and besought him to remove the images. After five days of discussion he ordered his soldiers to surround the petitioners and to put them to death unless they ceased to trouble him. He yielded only when he saw that the Jews would rather die than bear this affront. 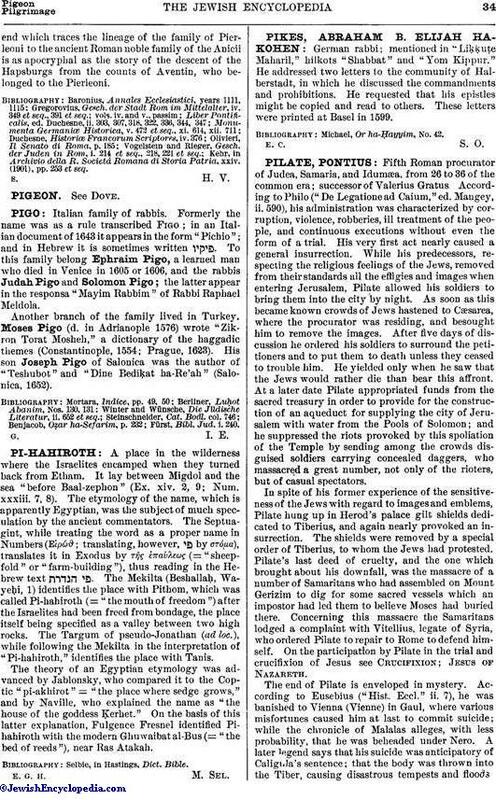 At a later date Pilate appropriated funds from the sacred treasury in order to provide for the construction of an aqueduct for supplying the city of Jerusalem with water from the Pools of Solomon; and he suppressed the riots provoked by this spoliation of the Temple by sending among the crowds disguised soldiers carrying concealed daggers, who massacred a great number, not only of the rioters, but of casual spectators. In spite of his former experience of the sensitiveness of the Jews with regard to images and emblems, Pilate hung up in Herod's palace gilt shields dedicated to Tiberius, and again nearly provoked an insurrection. 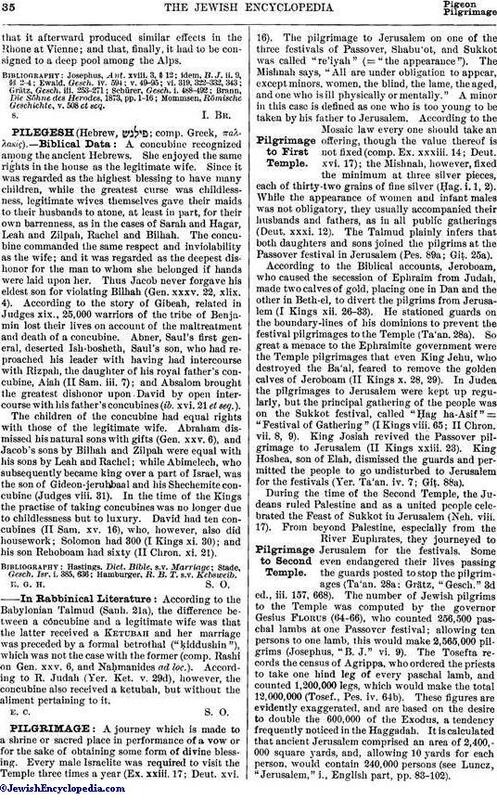 The shields were removed by a special order of Tiberius, to whom the Jews had protested. Pilate's last deed of cruelty, and the one which brought about his downfall, was the massacre of a number of Samaritans who had assembled on Mount Gerizim to dig for some sacred vessels which an impostor had led them to believe Moses had buried there. Concerning this massacre the Samaritans lodged a complaint with Vitellius, legate of Syria, who ordered Pilate to repair to Rome to defend himself. On the participation by Pilate in the trial and crucifixion of Jesus see Crucifixion; Jesus of Nazareth. The end of Pilate is enveloped in mystery. According to Eusebius ("Hist. Eccl." ii. 7), he was banished to Vienna (Vienne) in Gaul, where various misfortunes caused him at last to commit suicide; while the chronicle of Malalas alleges, with less probability, that he was beheaded under Nero. A later legend says that his suicide was anticipatory of Caligula's sentence; that the body was thrown into the Tiber, causing disastrous tempests and, floodsthat it afterward produced similar effects in the Rhone at Vienne; and that, finally, it had to be consigned to a deep pool among the Alps. Mommsen, Römische Geschichte, v. 508 et seq.